To Dog With Love: Fit Dogs at #Blogpaws! 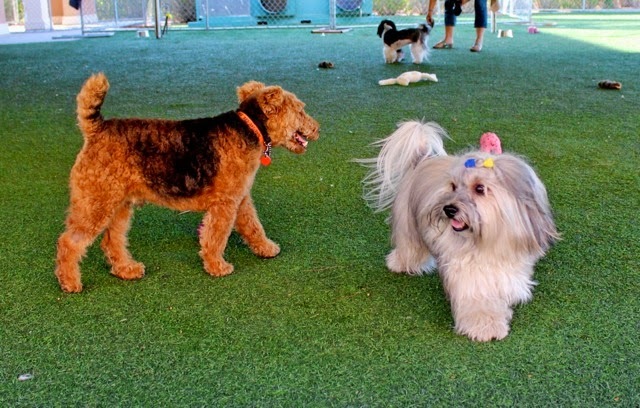 When were at BlogPaws a few weeks ago, we had lots of fun meeting up with some our FitDog pals. We took a few early morning walks and also had some time to play in the PetSafe dog park! Here are a few of our favorite photos. The first morning we were there, we woke up super early from the time change and while we were out walking at 6 a.m., we ran into Dolly the Doxie, Sugar the Golden Retriever, and Bailie and Emma from My GBGV Life. Look how nicely the pups posed for us! From left to right, that's Dolly, Rocco, Sugar, Emma and Bailie. Take a look at this crew! Wow! We managed to get six dogs and a cockatoo to pose at the same time! From left to right, that's Gretel and Chester from You Did What With Your Wiener; Rocco; and Leo the Cockatoo, Wilhelm, Brychwyn and Huxley from Cascadian Nomads. We had so much fun visiting with them all! Next it was off to the PetSafe dog park area. Rocco loved meeting Cardiff, who's human is the awesome Dr. Patrick Mahaney. Rocco whooped it up with some toys from PetSafe! Rocco took an immediate liking to Wilhelm. 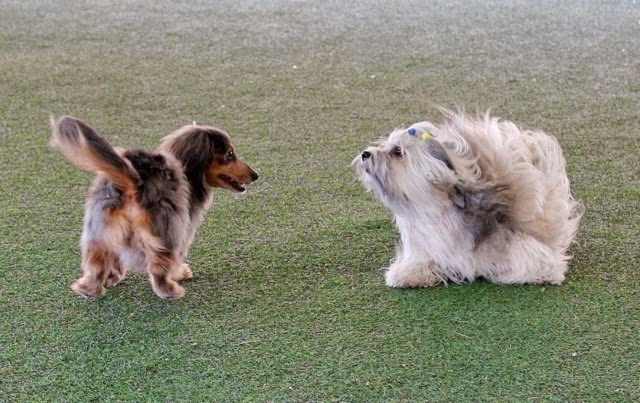 I think he was one of Rocco's favorite new pals at BlogPaws! 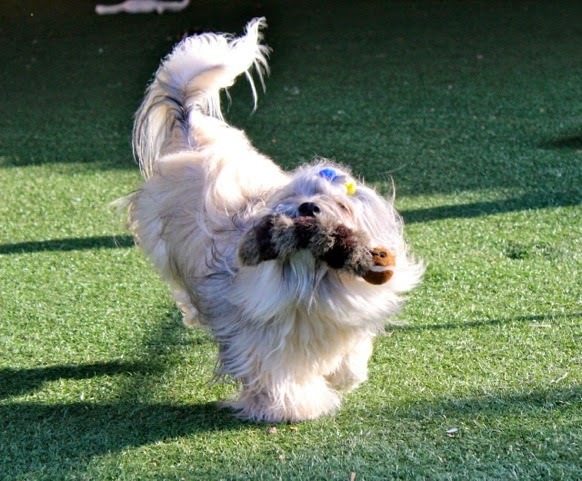 PetSafe also hosted a fun Yappy Hour where we learned about its fourth annual Bark for Your Park nationwide contest. One U.S. city will win $100,000 and four other finalist cities will be awarded $25,000 each to build an off-leash dog park in their community. From May 7 through June 7, anyone within the continental U.S. can vote for his or her city online at www.petsafe.net/barkforyourpark. In order to advance to the finals, each community must complete their application by finding a home for their dog park and encouraging their civic leaders to support the park. Based on the information provided by each city, PetSafe will confirm the availability of land, civic leader support, population size and total number of votes to select 15 finalist communities, which will be announced June 13. For more information, visit www.petsafe.net/barkforyourpark or check out the online video to learn what’s new for this year’s contest. That was a terrific meet and greet and nice seeing some of our friends there. Have a fabulous Friday. I can see myself in that Yappy Hour photo! Oh I really must try to get my Humans to take me to the 2015 in Nashville...although my Human may refuse because it's really hot for traveling and a heavy traffic time the end of May. Early May would be a much better time for takin' us along. Oh, you got to meet and play with so many great pals! It looks like all eyes (except Sugar's) are on Rocco in that first picture! Great photos - and a great group of FIT DOGS! Love to see lots of our FitDog Friday friends there. Wilhelm and Rocco are so cute together! I thought Mr. N would play with Wilhelm when they came to visit but he decided to play with Huxley instead lol. Awesome friends pics! We should have done more friends pics...add to list for 2015 I guess. Awesome photos. Look like you had a really great time at BlogPaws. Awesome photos! I cannot wait for next year's Blogpaws Conference! Nashville isn't too far for us. So cool that you got to meet so many pawsome pets! That looks like such a pawsome meet and greet! Hopefully, I'll get to meet everyone in Nashville! Hey!! Riley is in the background in the pic of Rocco & Cardiff!! It was so great meeting you there!! Can't wait to see you in Nashville!